Beckwith-Wiedemann syndrome (BWS) is a congenital stem cell disorder characterized by a defective developmental program that results in enlarged organs and the spontaneous incidence of childhood tumors. This disease is associated with aberrant expression of several growth regulatory genes, including silencing of β2-spectrin (β2SP, encoded by SPTBN1), a scaffolding protein for the SMAD3/4 tumor suppressors that signal downstream of TGF-β. While deregulation of TGF-β-mediated SMAD3/4 signaling is a validated contributor in certain cancers, it is unclear whether this pathway is responsible for driving BWS. Jian Chen and colleagues at the MD Anderson Cancer Center generated mice that are heterozygous for loss of both Sptbn1 and Smad3 (Sptbn1+/- Smad3+/-) and found that this model phenocopies BWS, including increased tumor incidence. Loss of both of these genes often occurs simultaneously in several human cancers, and whole transcriptome sequencing of both Sptbn1+/- Smad3+/- mouse embryonic fibroblasts (MEFs) and human BWS cells revealed downregulation of TGF-β signaling and upregulation of several cytokines and growth factors implicated in oncogenesis. Stimulation with TGF-β, shRNA-mediated suppression of β2SP, or pharmacologic inhibition of the TGF-β receptor in both human cell lines and BWS patient-derived cells revealed that β2SP and SMAD3 interact in a TGF-β-dependent manner and translocate to the nucleus where they bind to chromatin. Levels of CTCF, which binds 5’-CCCTC-3’ motifs in chromatin and prohibits transcription, were substantially reduced upon disruption of the TGF-β/β2SP/SMAD3 pathway. In hepatocytes, loss of CTCF expression derepressed TERT and MYC expression, both of which are known to contribute to unrestrained cell growth. Additionally, dysfunctional β2SP/SMAD3/CTCF signaling in MEFs and human BWS cell lines resulted in upregulation of many stem cell-associated genes, likely accounting for the increased tumorigenic potential of these cells. Overall, this study provides increased mechanistic insight into the genetic aberrations driving BWS and spontaneous tumor development. 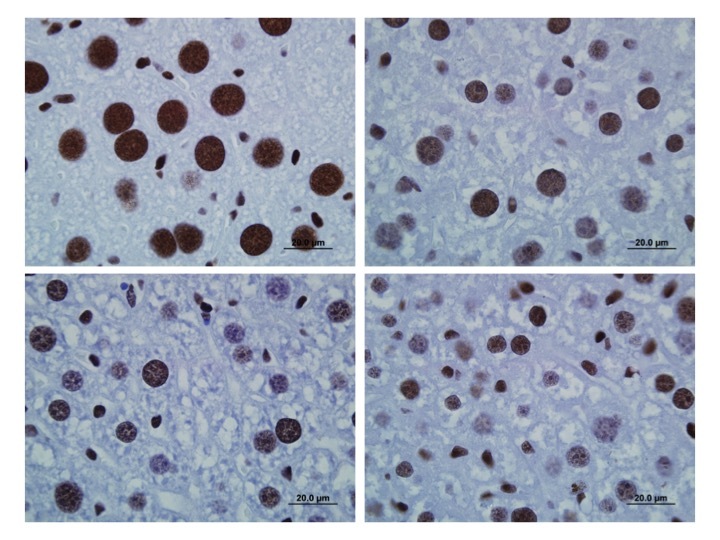 The accompanying image compares immunohistochemical staining of liver tissue from WT mice (top left) and mice with heterozygous for deletion of Sptbn1 (top right), Smad3 (bottom left), or both (Sptbn1-/+ Smad3-/+, bottom right), and reveals that mice heterozygous for one or both of these genes exhibit decreased expression of CTCF (brown). Citation Information: J Clin Invest. 2016;126(2):527-542. https://doi.org/10.1172/JCI80937. Beckwith-Wiedemann syndrome (BWS) is a human stem cell disorder, and individuals with this disease have a substantially increased risk (~800-fold) of developing tumors. Epigenetic silencing of β2-spectrin (β2SP, encoded by SPTBN1), a SMAD adaptor for TGF-β signaling, is causally associated with BWS; however, a role of TGF-β deficiency in BWS-associated neoplastic transformation is unexplored. Here, we have reported that double-heterozygous Sptbn1+/– Smad3+/– mice, which have defective TGF-β signaling, develop multiple tumors that are phenotypically similar to those of BWS patients. Moreover, tumorigenesis-associated genes IGF2 and telomerase reverse transcriptase (TERT) were overexpressed in fibroblasts from BWS patients and TGF-β–defective mice. We further determined that chromatin insulator CCCTC-binding factor (CTCF) is TGF-β inducible and facilitates TGF-β–mediated repression of TERT transcription via interactions with β2SP and SMAD3. This regulation was abrogated in TGF-β–defective mice and BWS, resulting in TERT overexpression. Imprinting of the IGF2/H19 locus and the CDKN1C/KCNQ1 locus on chromosome 11p15.5 is mediated by CTCF, and this regulation is lost in BWS, leading to aberrant overexpression of growth-promoting genes. Therefore, we propose that loss of CTCF-dependent imprinting of tumor-promoting genes, such as IGF2 and TERT, results from a defective TGF-β pathway and is responsible at least in part for BWS-associated tumorigenesis as well as sporadic human cancers that are frequently associated with SPTBN1 and SMAD3 mutations.